Since high school, Malloree Schurr has been a two-sport athlete. Beginning at Montgomery High School in Texas, Schurr played basketball and softball and was a letter winner in both sports. In basketball as a junior in high school, Schurr averaged 20 points per game and 10 rebounds, earning her offensive player of the year in her junior year. As a senior, Schurr was very impressive and still averaged a double-double with 17 points per game and 10 rebounds. Leading her team to a 31-5 record, Schurr was named the Montgomery Player of the Year but her team was ultimately eliminated in the state tournament. Now Schurr is a senior at ETSU majoring in sports science. For the Bucs women’s basketball team, Schurr has been that rebounder and energy player they need throughout her career. Schurr did not play much her freshman year in basketball for the Bucs, and only had highs of seven and nine points in 27 games. In her sophomore season, Schurr was third on the team in rebounds, starting in 10 games that season. In her first career start, she had 10 rebounds for the game. As a junior, Schurr started every game bringing tough defense and rebounding to the team. Schurr was third on the team in rebounds with 4.5 a game. Now in her senior year, Schurr has started 22 out 24 games this season. Her defense and leadership have helped the Bucs to a 15-10 record and one of the top teams in the conference. She didn’t stop at basketball accomplishments. Midway through the softball season in her freshman year, Schurr joined the Bucs softball team. She started in 12 games with a batting average of .390. In her sophomore season, Schurr did see a drop in her batting average and she started in 22 games during the season. Schurr was part of the Bucs softball team that went on to win the conference championship and play in the NCAA tournament in her junior year. Now in her senior year with the Bucs softball team, Schurr will have to wait until after the Bucs basketball season to contribute to the softball team. 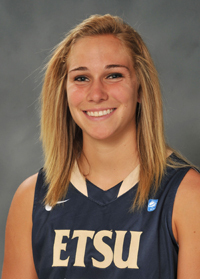 The Bucs will honor Schurr on senior night in basketball on Feb. 17 as the Bucs host Furman at 2 p.m. in Brooks Gym.